Genterprise has published a steady string of G.G. 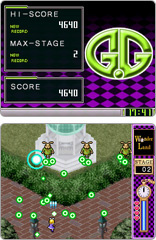 Series games for DSiWare, delivering some much needed arcade-style gaming at a budget price with the majority of games coming from development studio Suzak. 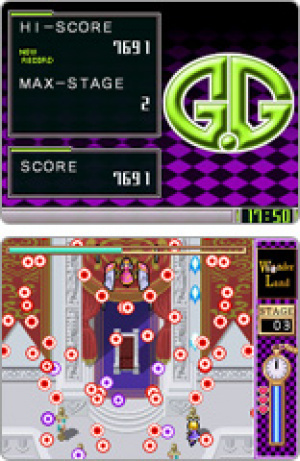 Wonder Land is a bullet hell shooter based upon Alice in Wonderland – not exactly a logical pairing, but certainly an amusing one. The sprite-based graphics are sharp with a decent level of detail, right down to Alice's dress billowing as she flies along blasting enemies into oblivion. As you might have guessed, players control Alice herself whilst enemies take the form of other characters from the books: in the first couple of stages you'll find playing cards as stationary enemies with mid-sized enemies taking the form of gryphons and "march hares." It doesn't take too long to reach the bosses: stage one is an anthropomorphic Cheshire Cat and the stage two boss is a female Mad Hatter. The gameplay couldn't be more simple: move and shoot. 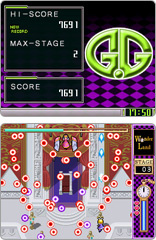 Alice has two different attacks: a three-way spread shot and a narrow-focused, but more powerful beam weapon. 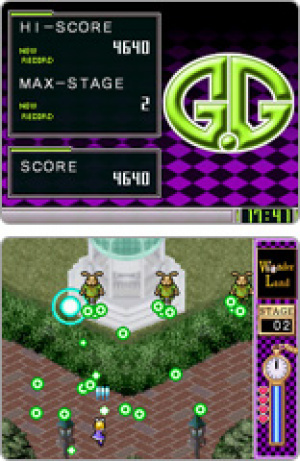 Her special attack is a "Time Bomb:" when the weapon gauge is filled, pressing A will cause all enemy shots on screen to turn into gems which are hoovered up by Alice – great during the challenging boss fights. Said bosses are quite tough by any standard: they have multiple attack patterns and large health bars that take awhile to wear down. Given there's no adjustable difficulty, no continues and some serious firepower coming your way, you'll need to either have the reflexes for this kind of game or not bother showing up. As with Aa Mujō Setsuna there are issues with the hitbox on Alice: smaller shots will sometimes pass through her without any negative effects, but they kill her often enough that you actually do need to get in the habit of avoiding them. Larger shots will take her out every time. Consequently, this is a much more challenging and satisfying experience than Nintendo's bigger budget release, though with a 200 Point price tag we cannot imagine there will be too many stages to play. As with the other G.G. Series games we've played there are no options to set or variant play modes and only the lower screen is used for gameplay (a bit of a waste in a vertical shooter), whilst the highest score/stage reached is recorded in the top screen. We certainly think someone should take it upon themselves to localise these games as they really capture the feeling of the arcade at a price point that makes an impulse purchase easy to justify . Wow this seems awesome, I hope they make it over here eventually. I would love for them to bring this over. I'm a little doubtful it will happen, though. I guess we'll find out.